"Love this campground! Two heated pools, lots of large camp sites and a family setting :)"
"We had such a good time at ARFC last year for our annual "Cousin Camping Trip" that we are headed back this weekend for a great couple days of fun at a FABULOUS place. ARFC is the only campground I would ever stay at in Somerset." 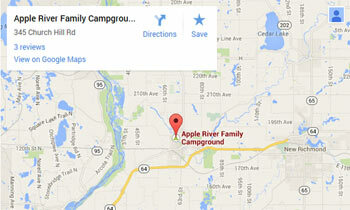 "Just had the best weekend spent with the family, James Panter, and Alicia Pilgram Apple River Family Campground! Not looking forward to work today! Have not been feeling the greatest but will make it through I am sure of that :)"
"Just had the best time at your campground, we were there for 5 nights and it was very enjoyable we had family, kids, and pets and everyone enjoyed themselves!"